Increasingly health-conscious consumers are demanding better food quality, such as improved food safety, nutritional value, freshness, and flavors. Traditional thermal pasteurization technology is known to have negative effects on sensory characteristics, flavors, and nutritional contents of food. Non-thermal processing technology has attracted widespread attention from food business operators. 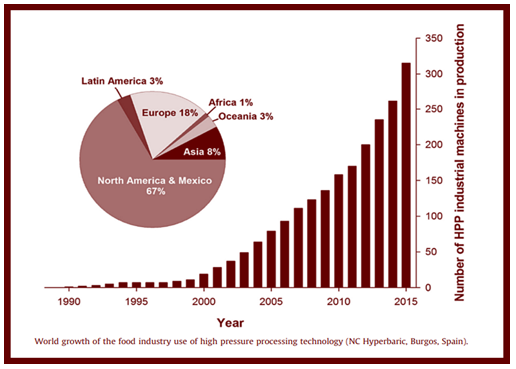 High-pressure processing (HPP) is the most successfully commercialized non-thermal processing technology. It ensures food safety and flavor. 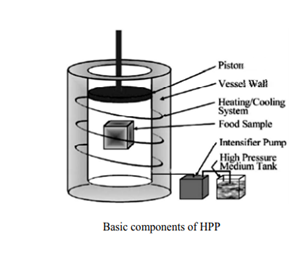 High-Pressure Processing is a non-thermal technique of food preservation that inactivates harmful pathogens and vegetative spoilage microorganisms by using pressure rather than heat to induce a pasteurization effect. It employs intense pressure (about 400-600 MPa) at refrigeration or mild process temperatures (<45 degrees Celsius), preserving most foods with minimal effects on taste, texture, appearance, or nutritional value. It can be used to process both liquid and solid foods with a high content of moisture. The basic components of an HPP system are a pressure vessel, a pressure transmitting fluid, a material handling pressurizing system and supporting units such as heating or cooling components. The most common transmitting fluids are water, food grade glycol-water solutions, silicone oil, ethanol solutions and castor oil. With the recent advancements in HPP processing, various manufacturers around the globe have developed the capacity to produce HPP equipment. Avure (U.S.A), Hiperbaric (Spain), and Multivac (Germany) are few of the major global manufacturers. A study reported that by 2015, more than 300 sets of HPP equipment have been operating for mass production worldwide. The packaging material has to be appropriate; it has to be flexible enough to transmit the pressure with no structural damage. The food is compressed during pressurization and the package has to permit a reversible deformation. The most common packaging materials used for HPP of food are polypropylene, polyester tubes, polyethylene pouches and nylon cast polypropylene pouches. Metal and glass material is not recommended as they will not be able to go undergo HPP treatment. Currently, flexible packs, jars, trays, and bottles are used as HPP packaging.